Researchers, engineers, executives, regulators, geoscientists, students, environmentalists and general public interested in energy security, coal mining, gasification technologies, clean coal options, alternative mining methods, and protection of groundwater. Investment professionals with an interest in energy, power generation and petrochemicals. Students of engineering, hydrogeology, rock mechanics and geology departments. What Makes a UCG Technology Ready for Commercial Application? Michael S. Blinderman is a recognized authority on Underground Coal Gasification (UCG) technology, with over 30 years’ experience in UCG research, development, pilot and commercial operations in Uzbekistan (Angren), Russia (Yuzhno-Abinsk), Australia (Chinchilla and Kingaroy), South Africa (Majuba), and New Zealand (Huntly West). He serves as a managing director of a UCG technology company, Ergo Exergy Technologies Inc., in Canada. Director, Ergo Exergy Technologies Inc.
Alexander Y. Klimenko received his PhD from Moscow University in 1991 and his DEng from the University of Queensland in 2007. He has 150 journal and conference publications which are cited more than 2370 times, and he is involved in various UCG projects. Dr Klimenko lectures in the School of Mechanical and Mining Engineering, the University of Queensland, Australia. This book is truly an eye opener to the sustainable use of combustion. 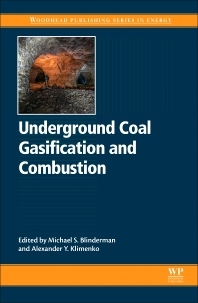 A must read for post-graduate students in energy, combustion and environmental science.